HUSTLEJAWN is a new concept brought to you by It’s The Life Creative. Known for thorough production and wide ranged experience in the creative and nightlife scenes, these ladies are bringing you a different kind of experience on a Friday Night in Philadelphia. 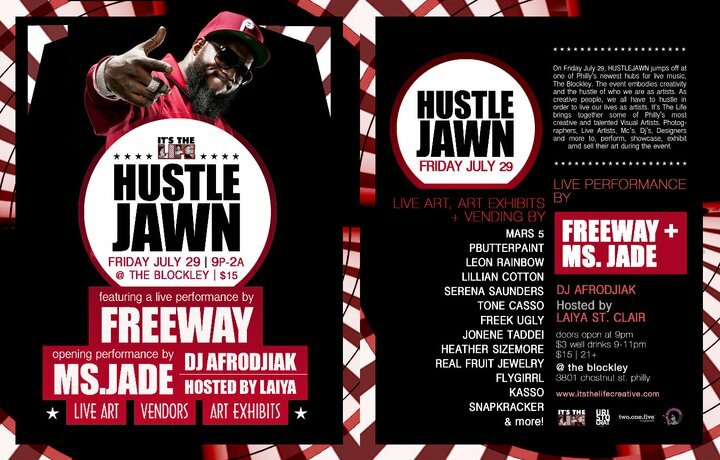 On Friday July 29, HUSTLEJAWN jumps off at one of Philly’s newest hubs for live music, The Blockley. The event embodies creativity and the hustle of who we are as artists. As creative people, we all have to hustle in order to live our lives as artists. It’s The Life brings together some of Philadelphia’s most creative and talented Visual Artists, Photographers, Live Artists, Mc’s, Dj’s, Designers and more to showcase their work and sell their work during the event. HUSTLEJAWN is proud to announce that Philadelphia’s Freeway headlining the show. ITL featured Freeway in their Inside The Studio Series almost a year ago. His story is a great one! Starting out in one area of the music industry only to end up at the opposite end of it all. Now performing at events like Bonaroo and SXSW, he’s on a new mission. Opening up the event will be ITL’s very own, DJ Afrodjiak. An opening performance by none other than Ms. Jade will start the show. Having a Freeway + Ms. Jade show is no doubt a powerful punch. In addition, Live Artists and Vendors will surround the venue, offering amazing visuals, exhibited works of art and items for purchase throughout the night. We invite you to come out early and take it all in. We encourage Philadelphia to come be a part of something really special. The complete details of the event are below. If you are interested in Exhibiting, Painting Live or Vending, please contact Stacey Wilson at flygirrl@gmail.com for more information.